Rory McIlroy says he’s lost his fear of Tiger Woods - but not his respect. The Ulster sensation, 20, will tee it up today as the seventh favourite behind the world No 1 to lift the Claret Jug in his first Open start as a professional. But McIlroy says he’s inspired rather than intimidated by the greatest player in the game and prepared to wait for his turn for major glory. Careful not to rile Woods, McIlroy said: “He's not just another player. I remember when I first came out and I talked to Tiger, I was even nervous talking to him. He just has some sort of aura about him. “But he's just an incredible competitor. He hits shots that I wouldn't be able to hit sometimes. He's not won 14 majors for nothing, and I'm sure he'll win a few more before his career is over. McIlroy knows he has the game to win majors but while he realises that it doesn’t have to happen this week, he finds it hard not to dream of lifting the trophy himself on Sunday night. Ranked 22nd in the world, he said: “I've been very pleased with my progress in the majors this year, finishing 20th at the Masters, and then finishing 10th at US Open. So I've sort of proved to myself that I do have the game to get around major championships. “I sometimes say to myself, you know, this is only your second Open Championship. You'll have 20 or 30 more of these. There's no point in trying to rush into things. “But there's also a part of me that says, well, you've got the game to do well here. I think it's a balance between having the right expectations and then obviously going and trying to fulfill those. “It is hard, because kind of walking up the 18th, you catch yourself thinking about oh, what if this happens or that happens, how good would it be to win The Open." McIlroy has taken over from Sergio Garcia as the heir apparent to Tiger but knows that winning majors is tougher than ever with the young Spaniard still waiting for his first win. He said: "Sergio is one of the best players in the world. He's one of the best ball‑strikers, if not the best ball‑striker I've ever seen, and he's still to win a major. “But I think once he wins one I think that will sort of open the gate a bit for him and he'll go on to win a lot more. “You've got to play so well to win. And even if you get yourself into position to win, it's very hard to close it out because it is a major championship and everything that comes with being a major champion. Patience will be the key for McIlroy this week on a course that should suit his game if the weather is reasonable. Driving the ball well is one of the strengths of his game and he’s prepared to be patient and wait for his chances to come around. He also knows that there are 21 guys ahead of him in the world rankings and another 40 who have played more links golf in the Open than he has in the last 10 years. But after sorting out some swing problems that dogged him at Loch Lomond last week, he’s feeling confident about his chances on a course that he hopes will bring out his links roots. He’s been handed a plum draw with US star Anthony Kim and two-time US Open winner Retief Goosen. It’s the third time he’s been paired with Kim in the majors this year and he’s hoping they can chat away as GOosen goes about his business. 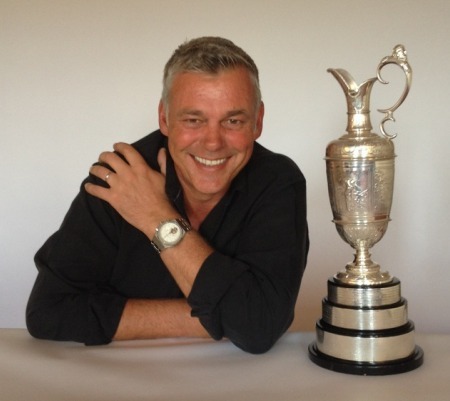 Darren Clarke poses with his prize possession. Picture via @darrenclarke60Darren Clarke admits he fell into the classic Open championship winner’s trap after he fulfilled a lifetime dream and lifted the old Claret Jug at Royal St George’s last year.